We are a Four Star center, one of the highest in the Natchitoches area, and I, Clara Delacerda, the owner/director, contribute this to the hard work and dedication of myself, as well as my teachers. We accept children from infant to 13 years of age. Each child is given the love and respect they deserve to become well adjusted and is encouraged to strive to become their best. The knowledge of learning is taught in a positive way through development-appropriate practices and our goal is to ensure that the children always feel safe, loved, and important. The teachers strive to give each child, from infant until Kindergarten, the foundation to know that they will succeed throughout life. We offer after-school pickup, summer, and holiday care for school children. The summer is filled with arts and crafts, games, field trips, and visitors from the community. Parents are encouraged to be part of our program as often as possible because we offer an Open Door Policy which includes everyone from breastfeeding moms to basketball playing dads. To sum it up this is you and your child’s home away from home, where we are all one family. 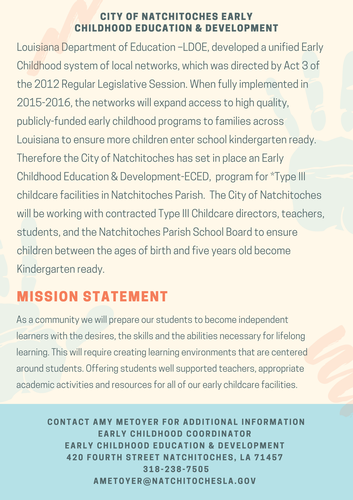 Tiny Tots Daycare and Preschool is located at 1212 Keyser Ave., in Natchitoches, LA.